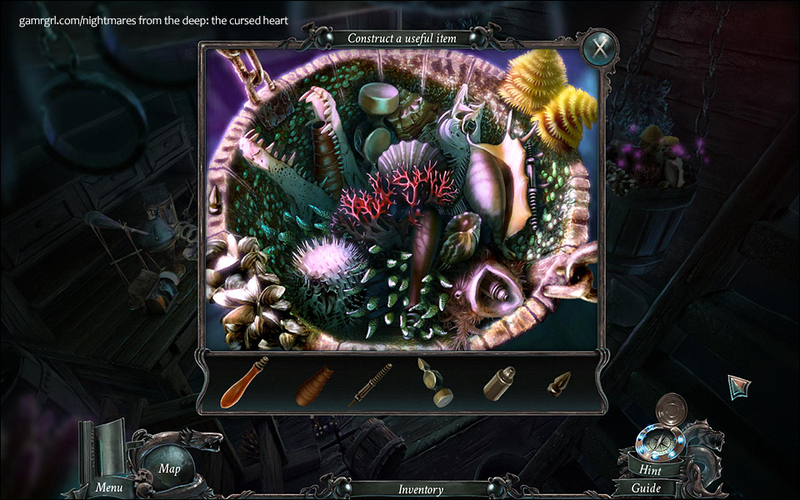 I recently upgraded to Windows 8, and among the ‘free’ games at the App Store is Artifex Mundi’s Nightmares of the Deep: The Cursed Heart CE. This claim is misleading because the game is NOT free: only a brief, playable demo is, but as a consolation of sorts, at $6.99, it’s heavily discounted from the retail price of $16.99. 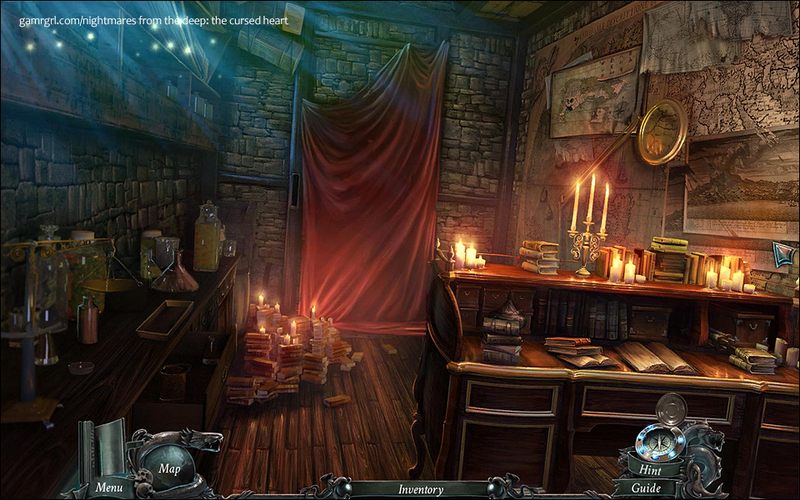 Having previously reviewed two remarkable games of the studio for Adventure Gamers - Enigmatis: The Ghosts of Maple Creek and Times Mysteries: The Ancient Spectres, I was excited about their latest offering, and as the game progressed, that anticipation turned into delight. 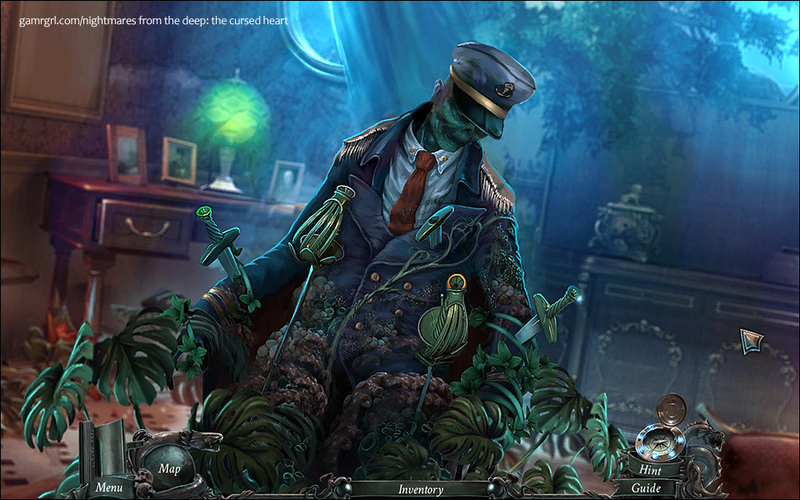 Built on a poignant supernatural story spanning centuries and driven by practical inventory-based quests, interesting puzzles, fabulously atmospheric art, and an empathetic, competent heroine, this engrossing, entertaining casual adventure is well worth the investment. An animated prologue introduces us to the brutal pirate Remington, who terrorised merchant ships in the Caribbean in the 18th century till he was apprehended by the authorities and sentenced to death for his crimes. 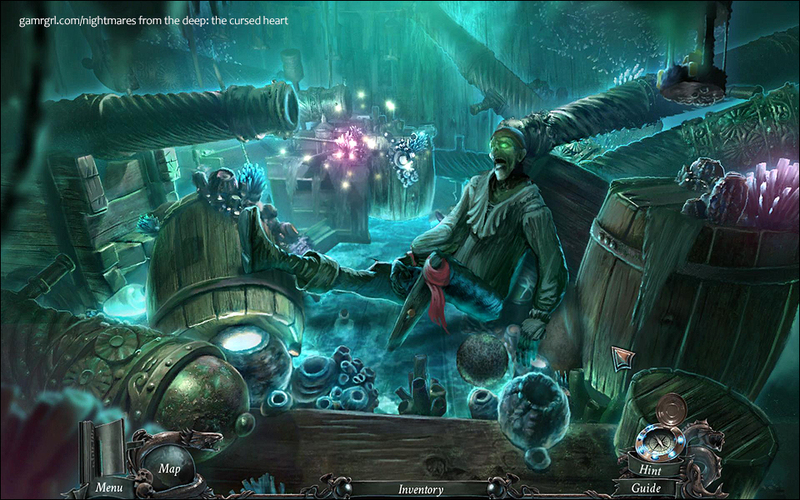 Shoved ingloriously overboard, Remington languishes at the bottom of the ocean, kept alive by a pact of immortality he made with Davy Jones, till a modern day research ship retrieves his body and sends it to a museum for their upcoming exhibition. Curator Sarah Black inadvertently rejuvenates the mummified body while outfitting it for the show, and is plunged into a waking nightmare as Remington kidnaps her daughter and takes off in his ghost ship for his lair, Skull Island. 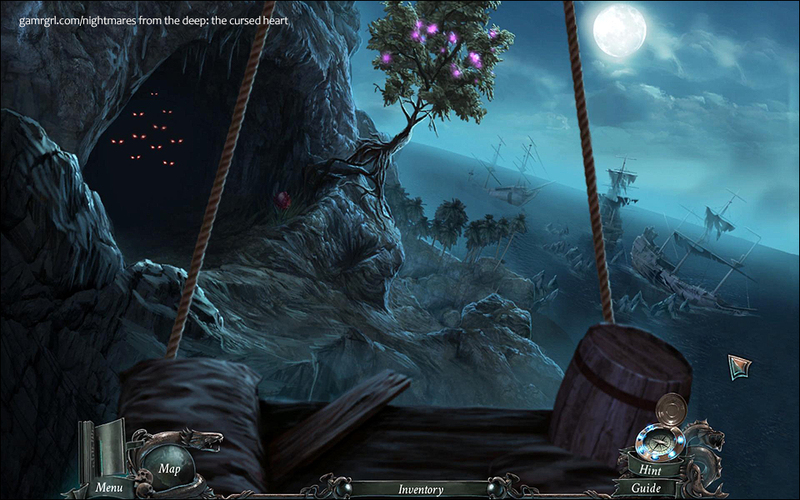 Determined to save her daughter, Sarah jumps aboard, but has her task cut out for her as the pirate proactively thwarts her efforts while he tries to revive the spirit of his long-lost love, Mary, using the young girl’s life force. 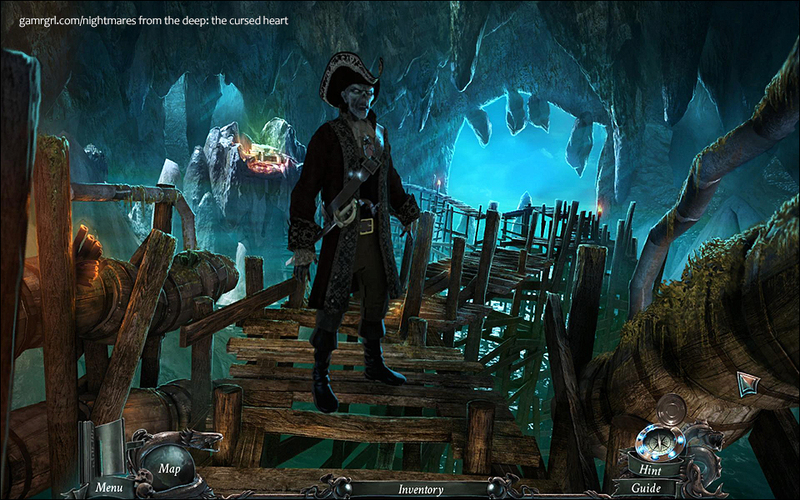 Playing as Sarah, you spend the initial part of the five-odd hour game on board the centuries-old, ghost-infested pirate ship, and the rest of it at the literally-named Skull Island. These, along with the museum, add up to about thirty unique screens. 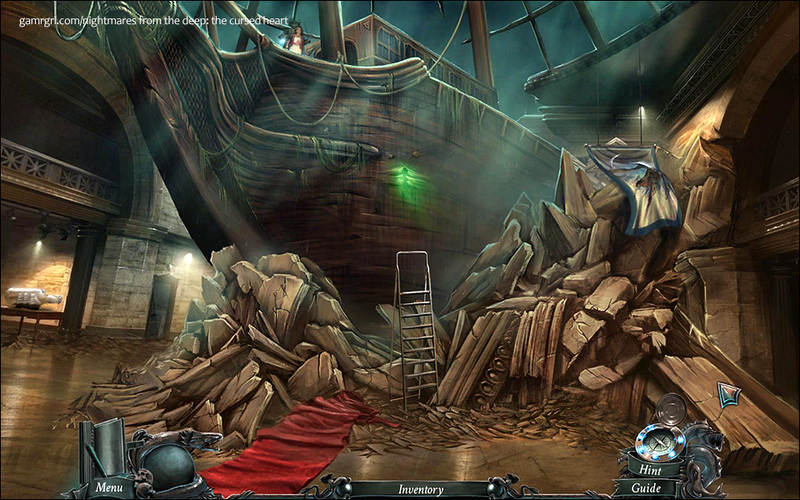 The eerily-glowing, rotting ship is equipped with crew quarters, a galley, a supply hold, an ammo dump, and the Captain’s cabin, while the island comprises three sections: the outskirts, which features Mary’s crypt, a rambling stairway and a bat-cave; Remington’s crumbling castle and its assortment of rooms and catacombs; and a beach and lighthouse on the far side. 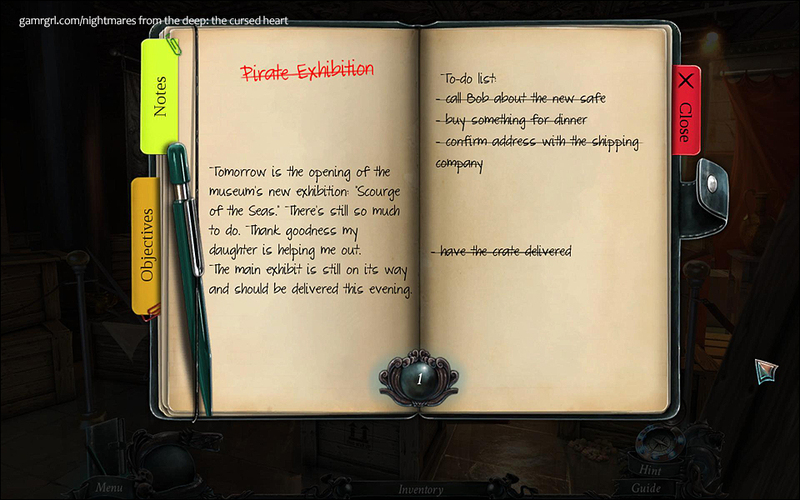 Most areas of the ship and the island are always available to explore, but Sarah is kept on track by a couple of maps which mark her current location, and more importantly, places where she has things to do. There is still a bit of walking around, particularly to-and-from Mary’s crypt to other places, but that’s acceptable as progress is linear and straightforward. If you need an occasional nudge, you can refer Sarah’s diary for her objectives. 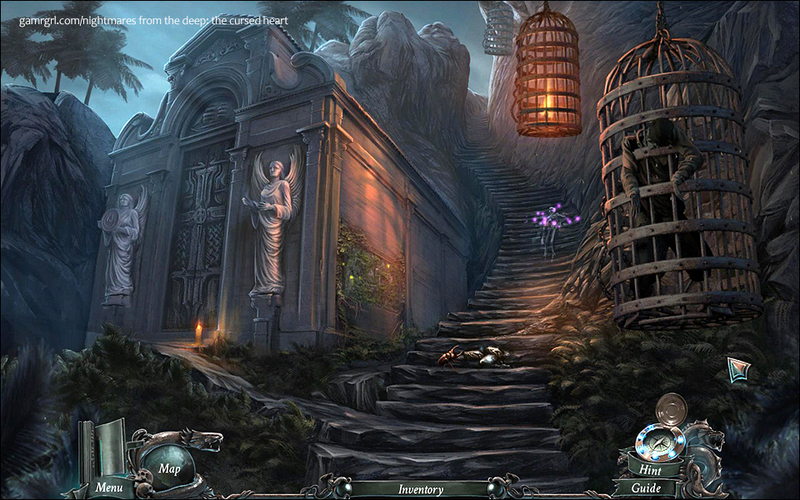 At the outset, you must choose between two difficulty levels, the key differences being that in the tough mode, active areas do not sparkle, and there is a penalty for wrong clicks on hidden object scenes. 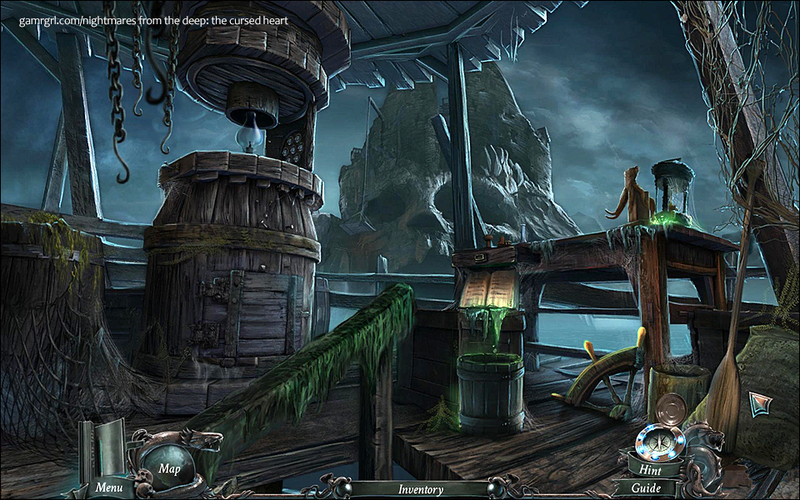 An interactive tutorial introduces the gameplay mechanism: left-clicking the mouse allows interaction with onscreen hotspots, other characters or inventory objects, as well as navigation between the slideshow-style screens. 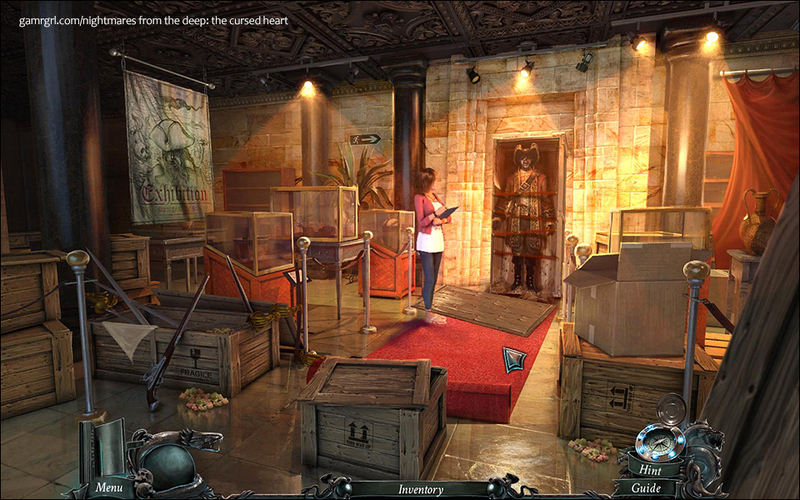 Tasks are easy but interesting: Sarah has to collect useful items, either directly off the scenes or from hidden object screens, and use them to get past obstacles like closed doors, solve puzzles, and do favours for various ethereal entities. 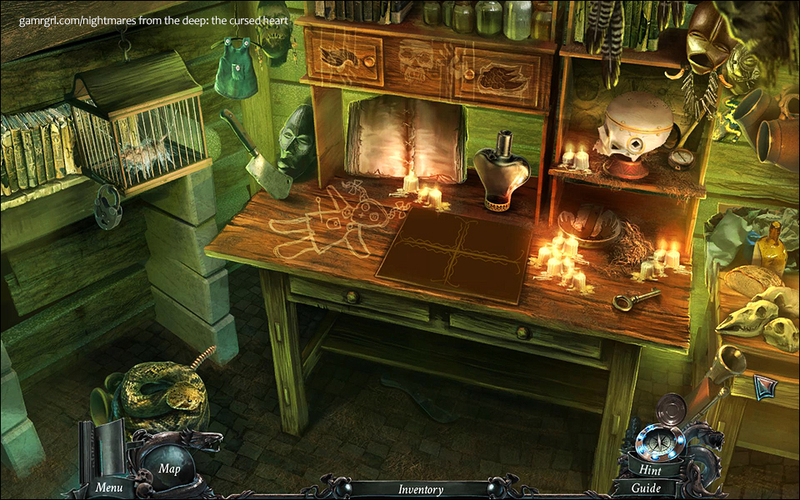 Many activities have to be done manually, like removing swords individually or chopping wood a plank at a time, which adds a touch of realism. A host of descriptions and instructions, given by Sarah or provided via notes and books, keeps progress intuitive. 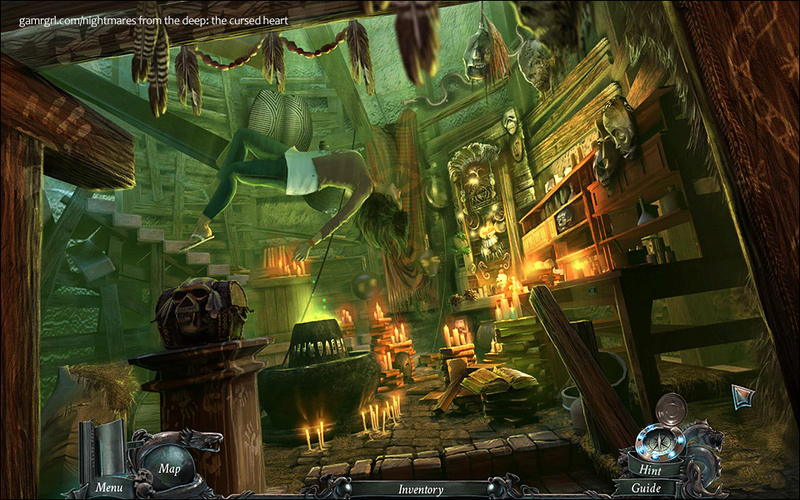 The challenges include inventory-based quests, standalone puzzles, and hidden object searches, and the latter can be swapped with games of pirate-themed Mahjong. 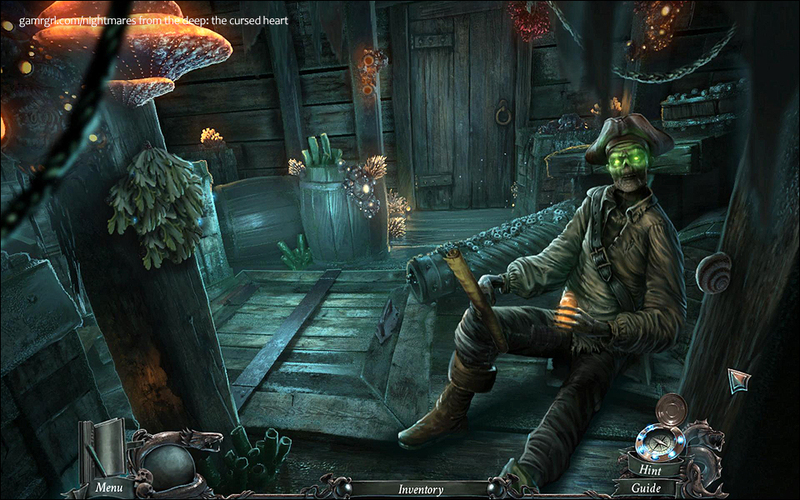 Several quests stretch over hours, like gathering a dozen doubloons for a creepy magical chest to eke out Remington’s history, while other quests involve collecting things and using them according to instructions in chemistry experiments or to conjure up voodoo spells. 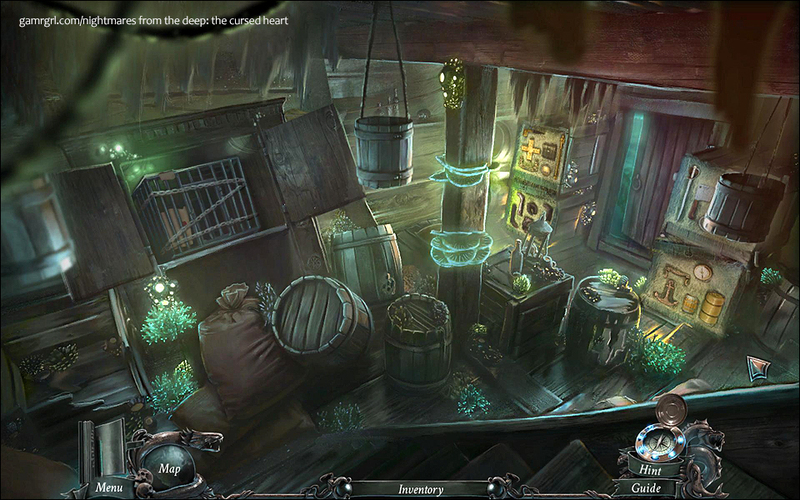 Practical items like crowbars and knives are reused, and the inventory is instantly cleared of used objects. 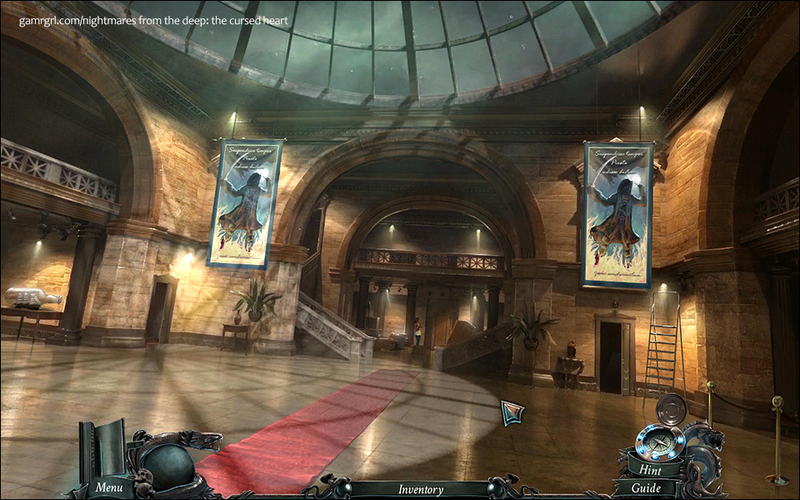 Similarly, hotspots are disabled once exhausted, keeping the game world clutter-free. 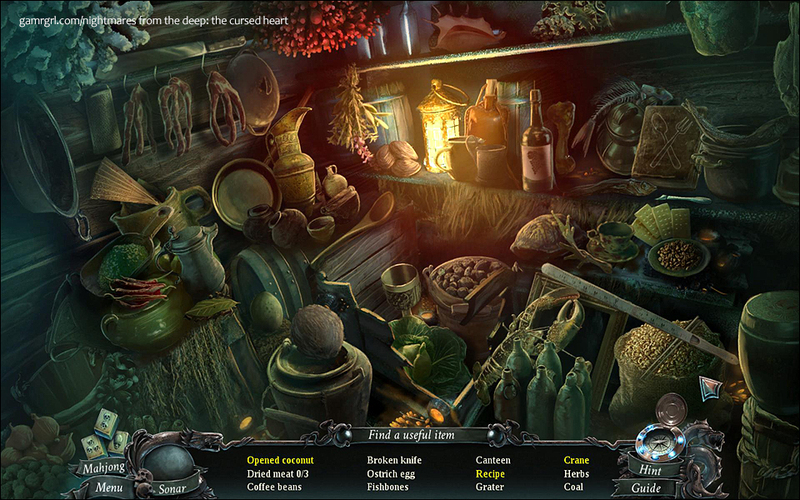 The dozen-plus hidden object scenes are well-embedded into their locations, and are stocked with items that fit the setting as well as the era, like old-fashioned, rusting pots and pans in the galley. Some of the objects require minor interactivity to uncover, such as loading a gun with bullets before you have a ‘loaded gun’. 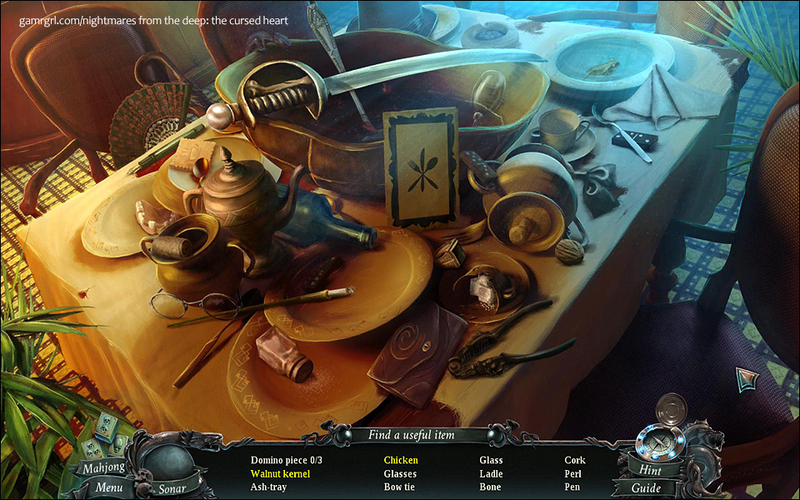 Each scene is revisited at least twice, and sometimes even thrice, but objects already found are removed from the stash for later searches. Each search yields one useful item. 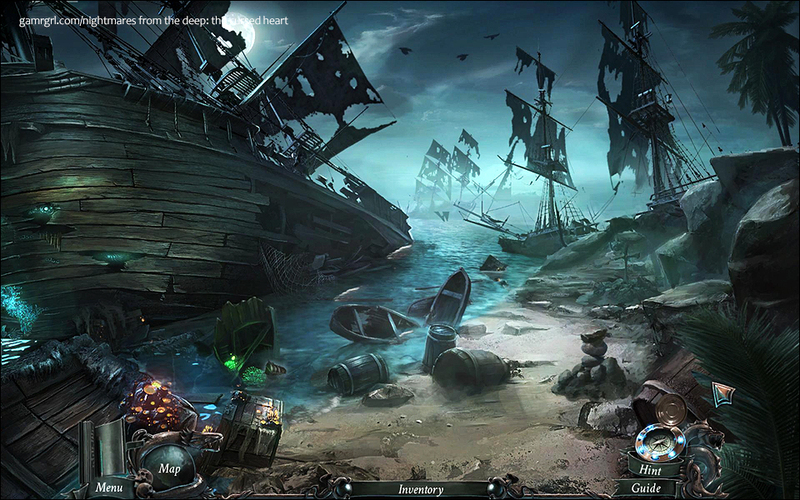 Besides these full-fledged screens, there are mini hidden object pop-ups containing scattered pieces of useful objects. 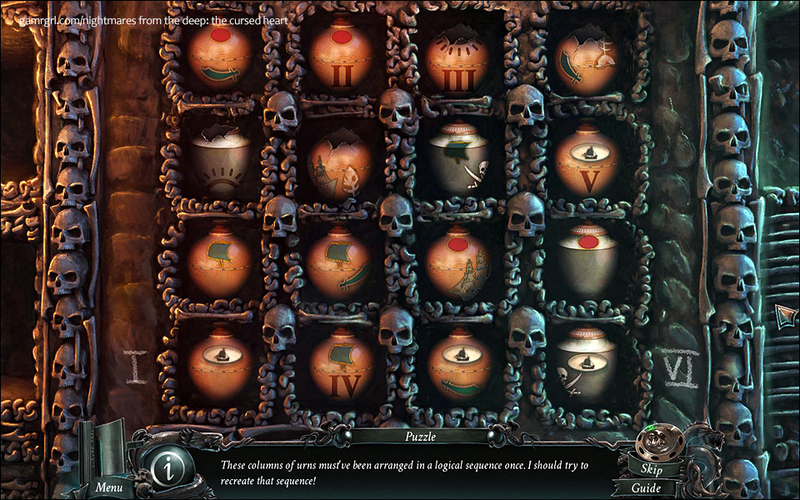 The fifteen or so standalone puzzles are tightly integrated with the story in logic and visual design, be it sorting pirate gear into hay-lined crates, organising burial urns in a catacomb, or guiding a fish through a mazelike fountain. 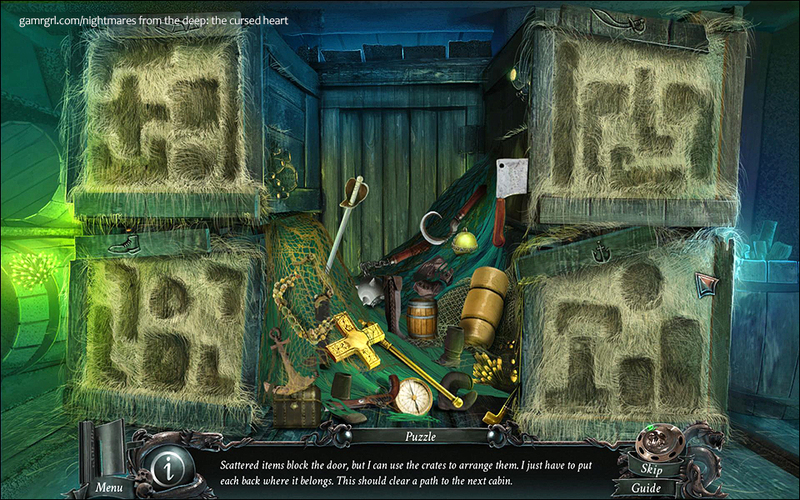 The collection of jigsaws, mazes, colour and pattern matches, gear sets, sliders and rotators mostly open locked doors and containers, but some also yield quest items and information. 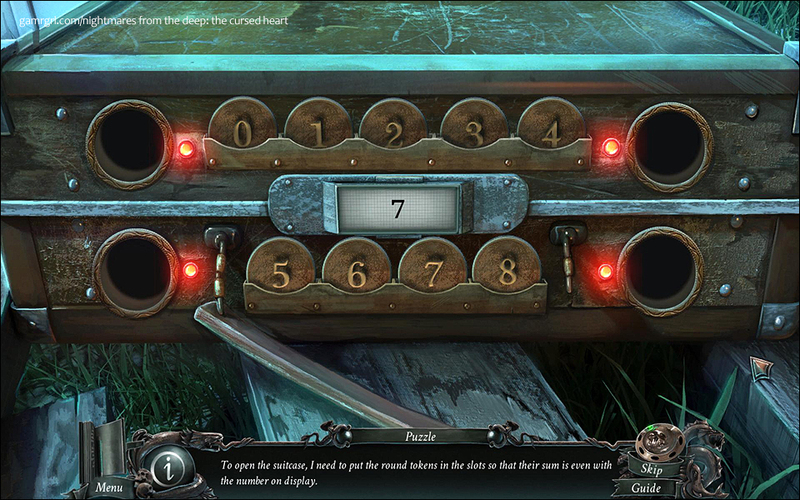 Puzzles can be skipped after a while, but are not difficult and do not really warrant the exit option. 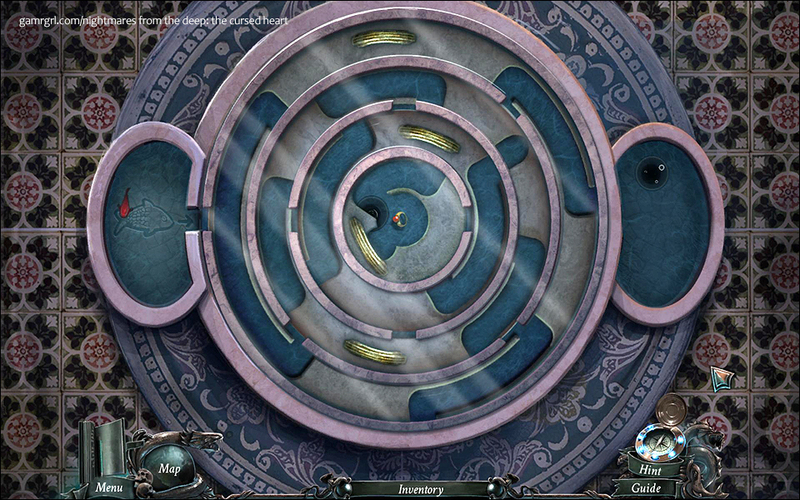 You also get a bunch of accolades for your efficiency, such as recognitions for wrapping up puzzles under a minute, or finding three hidden objects in less three seconds or less. 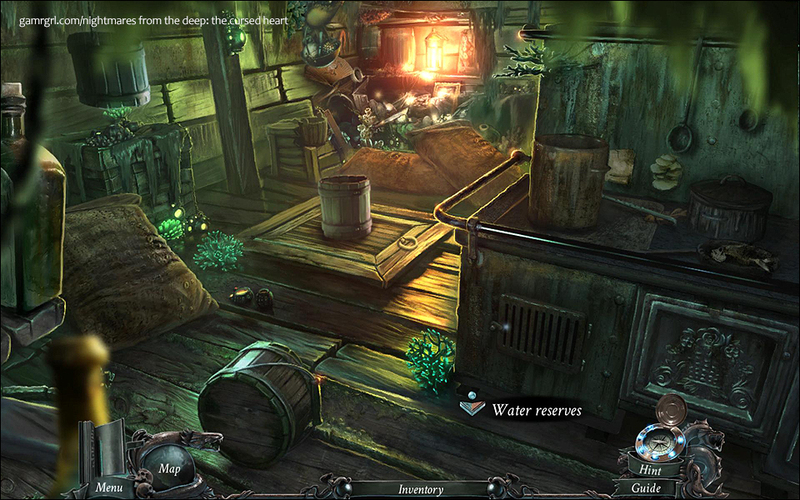 The games boasts detailed, realistic looking screens that scale perfectly even to high resolutions like 1920x1200, though the cinematics become a little pixellated at larger sizes. 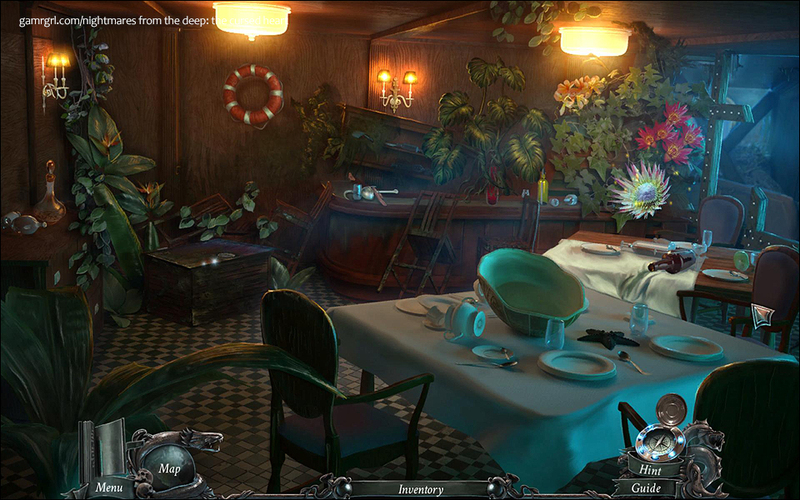 The creepy, maudlin atmosphere of the ghost ship, lit by the bluish-green glow of bioluminescent algae is spot on, as are the decrepit remains of the once-proud structures of Skull Island, artfully decorated with rotting upholstery and shattered artifacts. 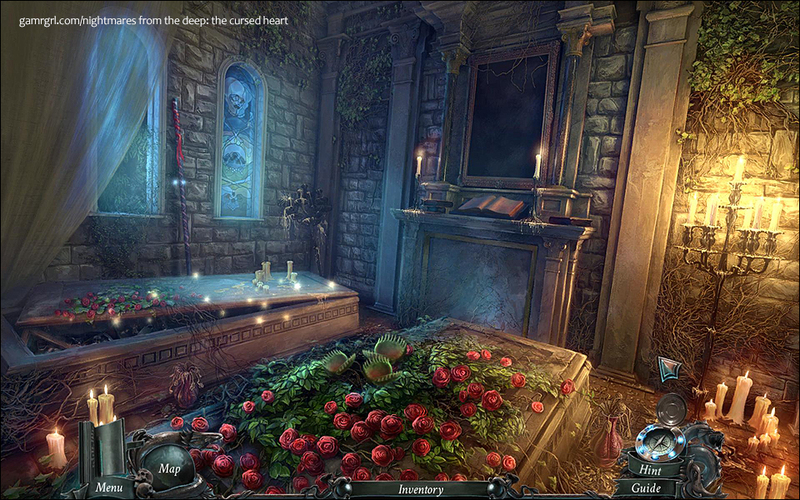 A lot of effort has gone into maintaining visual continuity: puzzles and hidden object scenes are designed to match their settings, while the action-packed cutscenes blend almost seamlessly with the game screens. 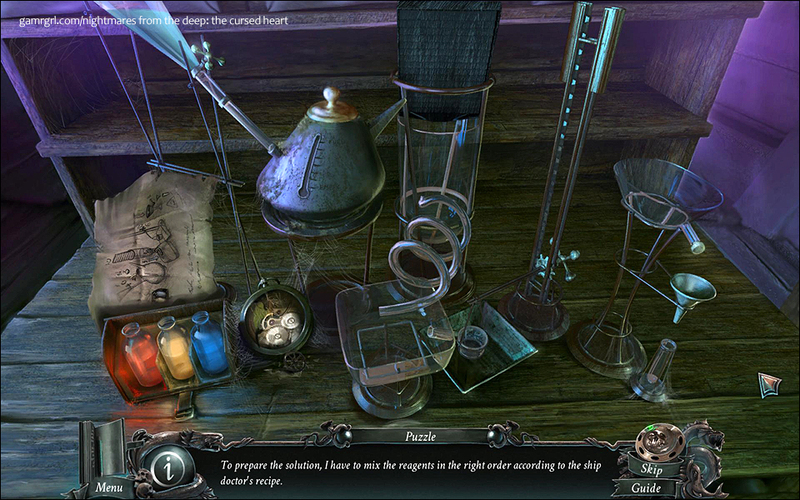 Interactive items are zoomed in via pop-ups, and changes made to these objects, like if a door is opened, reflect in-game once the pop-up closes. 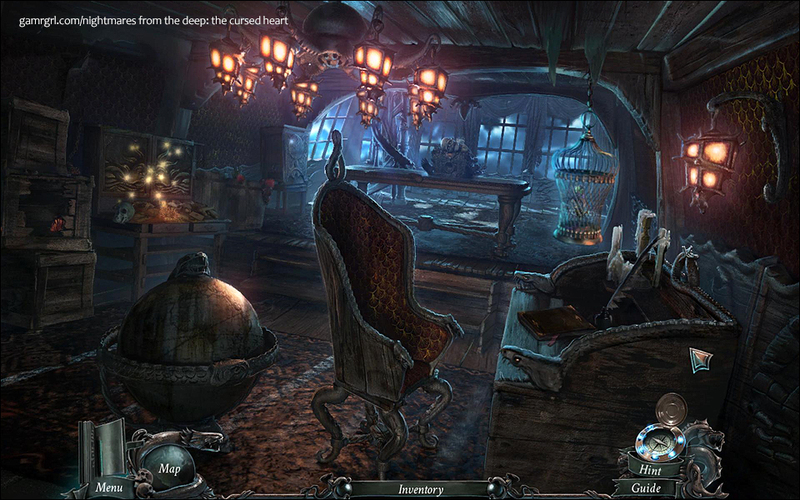 Screens are enlivened with flickering lights, wavering shadows, scurrying critters, and gently lapping waves, and some of the cutscenes are outstanding, like the way Remington’s ship barges into a building, or the undead guardian that collects doubloons with his decaying fingers. However, while the characters are animated to ‘talk’, there is no lip-syncing with their dialogues, which creates an awkward fish-like open-shut mouth movement. 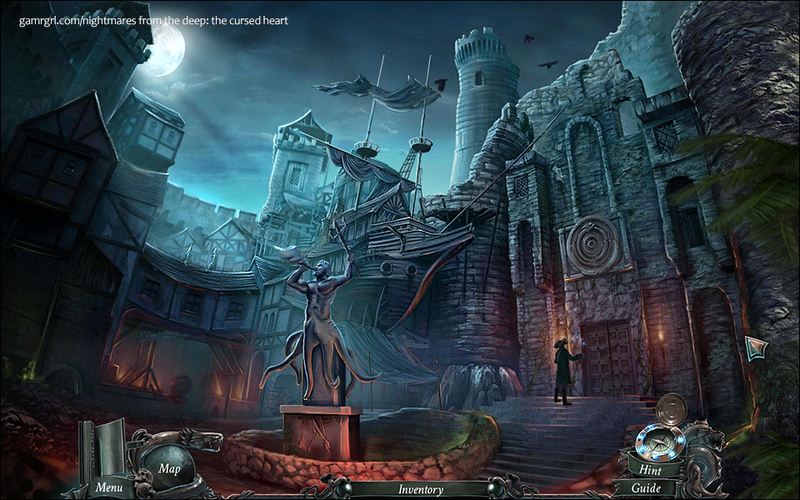 The orchestral background score varies from gravely menacing to pleasantly wistful from screen to screen, and changes constantly if you flit quickly between locations. 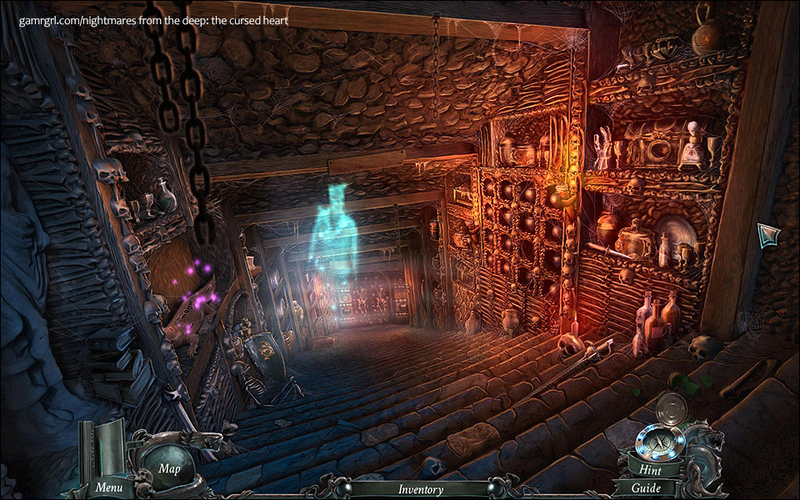 Dialogues are crisp and easy to understand, and voiceovers are well-suited to the characters, be it Sarah, her daughter, Remington, or even the ghost pirates. 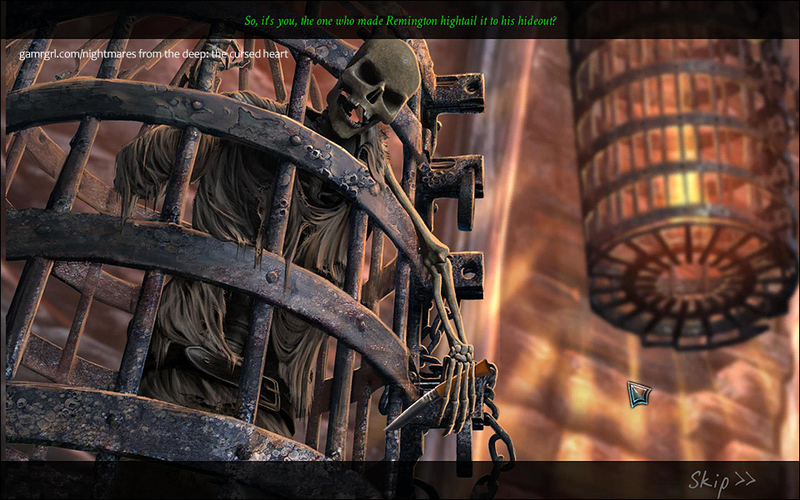 Activities and events have apt sound effects, extending to the clacking of the skeletons’ teeth when they speak. A cool touch is Sarah’s radio, which has four music channels. 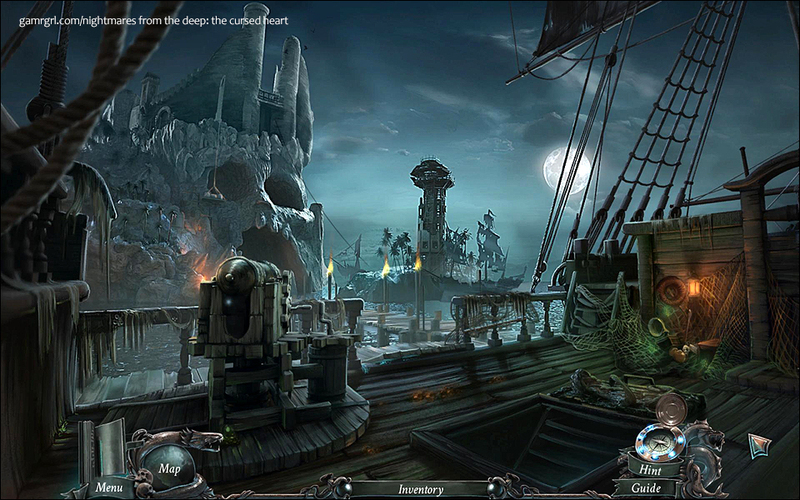 The bonus play of the Collector's Edition takes about thirty minutes to address a practical issue – Sarah’s return to the mainland from Skull Island. A message in a bottle from a distressed ship leads her to a century-old shipwreck. 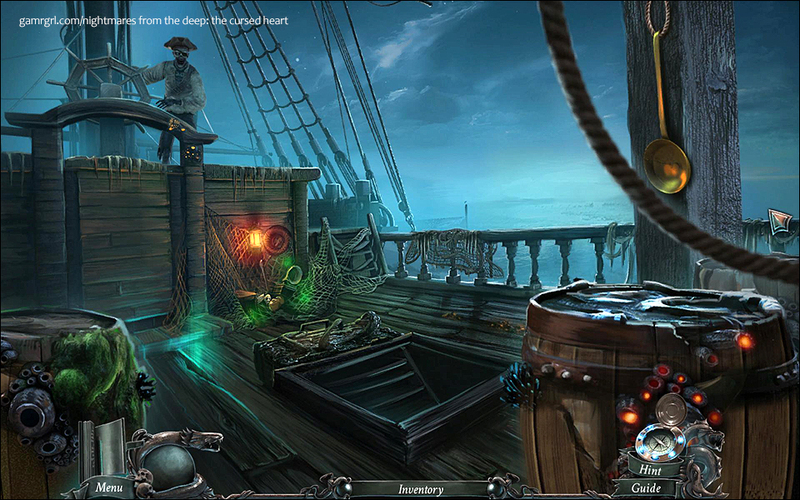 Onboard lingers the undead corpse of its captain, and she must devise a way to free his soul in exchange for a map of the area. 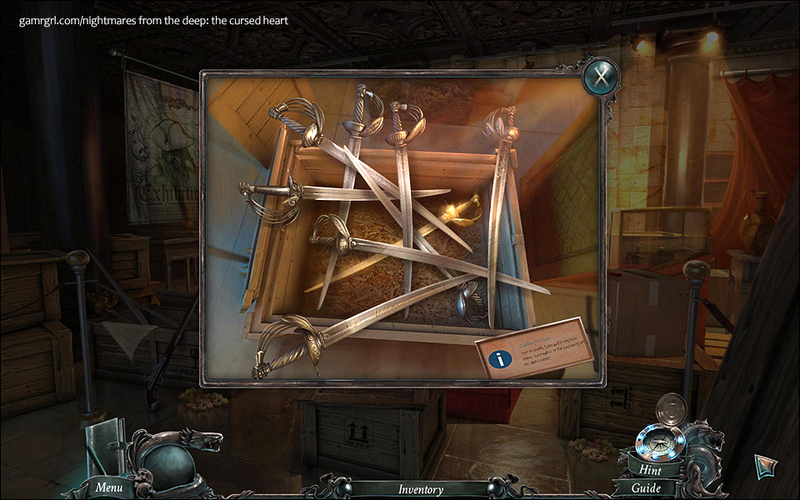 Five new hidden object scenes and a handful of puzzles embellish this brief but well-crafted segment, which loyally follows the inventory-based route of the main game while carrying forth the idea of salvation from mistakes of the past. 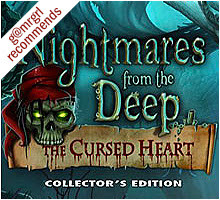 Nightmares of the Deep: The Cursed Heart CE is a beautifully illustrated and creatively designed game that expertly steers a story, which starts off as the vicious reincarnation of an unsympathetic pirate with the diabolical agenda of resurrecting his dead lover, into a bittersweet tale of prejudice, betrayal, loss, and finally, redemption. Intelligent and practical Sarah holds her own against the willful Remington, her resolve to rescue her daughter far greater than her fear of chasing ghosts into the unknown. 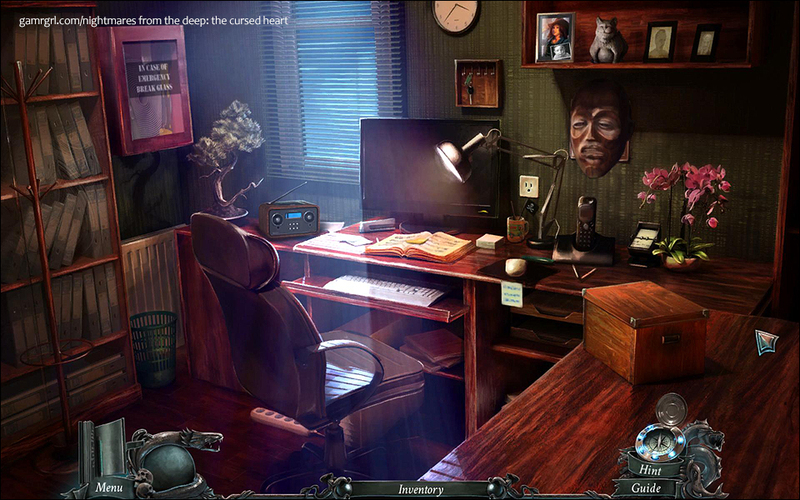 And though the game isn’t terrifying as a ghost story, primarily due to the plot being grounded in a doomed romance rather than direct malevolence, a handful of startling moments do get your pulse racing. 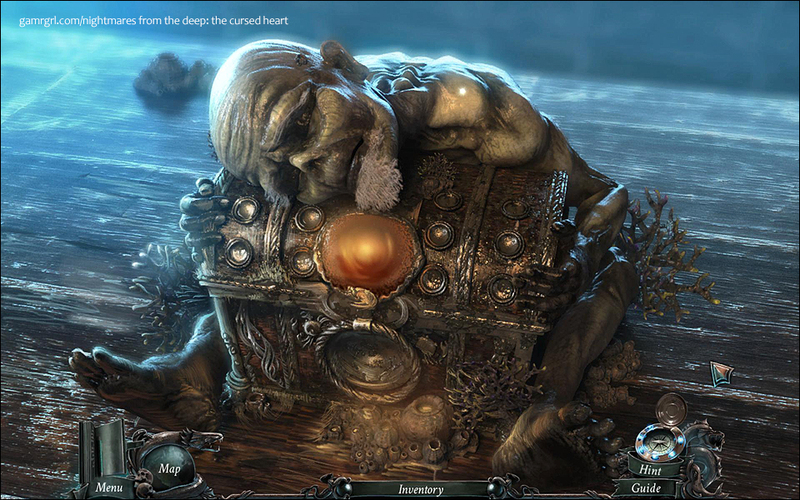 But cheap thrills aren’t the reason to invest in this game – its solid story, interesting quests and puzzles, and fabulous art and animation are. The extension, though well-made, is on the shorter side, but all things considered, a trip to Skull Island is a definite recommendation for fans of the genre. This is an original review written by me. Please do not distribute the text and images without my written consent.